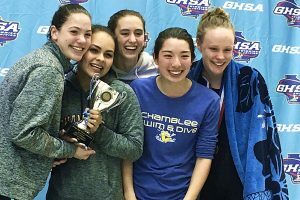 Three gold medals and two silver piled up the points for the Chamblee Lady Bulldogs as they came up just short of the Class 1A-5A state championship at the recent GHSA Swim and Dive Championships at Georgia Tech. Chamblee collected 210 points just nine short of champion Marist’s 219 at the two-day event with only four swimmers qualifying for the finals on Saturday. 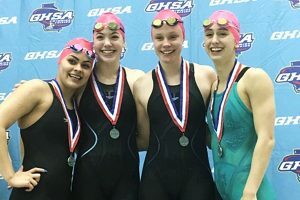 “Our four girls put together a very strong showing in the team competition,” said Greg Valley, Chamblee swim coach. “It was an amazing performance with just those four qualifying for Saturday’s finals. The meet got off to a great start for Chamblee as the team of Teresa Maloney, Julia von Biberstein, Jade Foelske and Brynn Lautenbacher swam to an All-American Consideration time of 1:46.97 in the 200 medley relay to take the gold. Sophomore Jade Foelske collected a pair of Top 2 finishes taking gold in the 100 Butterfly with an All-American Consideration time of 54.70. It was Foelske’s second consecutive gold in the event. She captured a silver medal in the 200 individual medley with another All-American Consideration time of 2:02.93. A second silver medal came in the 200 freestyle relay as the relay team of Biberstein, Foelske, Lautenbacher and Maloney clocked a 1:37.88. Senior Julia von Biberstein swam an All-American Consideration time of 1:03.97 to bring home the gold in the 100 breaststroke. The Bulldogs finished third for the third consecutive year in the boys’ competition with 233 points behind St. Pius X (340) and Westminster (283). Sophomore Liam Bell had the top performance with his time of 57.46 in the 100 breaststroke good for a silver medal finish. The Bulldogs also got a pair of bronze medals in relay competition. The team of Louis Cardot, Liam Bell, Brian Fadjariza-Damais and Theo Hardy swam to a time of 1:35.89 for the 200 medley relay bronze medal. Grant Burke, Alex Miretsky, Theo Hardy and Noah Oh swam to bronze in the 200 freestyle relay with a time of 1:28.91. Druid Hills finished in a tie for 29th out of 53 teams behind a pair of strong finals swims by senior Lee Haber. Haber was sixth (1:56.29) in the 200 individual medley and seventh in 100 breaststroke (58.70). The Dunwoody Lady Wildcats finished in the Top 10 of 45 teams in the Class 6A-7A girls’ state meet at Georgia Tech. Dunwoody collected 165 points led by senior Allie Reiter’s silver medal finish in the 100 breaststroke (1:02.45) and sixth in the 200 individual medley (2:04.57). Senior Laura Spratling was sixth in the 50 freestyle (24.05) and freshman Lauren Davis was sixth in the one-meter diving (453.25) to add to the Dunwoody total. Lakeside was 25th in the girls’ competition led by Julia Shuford’s two Top 10 finishes in the 200 individual medley (2:06.66, 9th) and the 100 breaststroke (1:04.27, 7th). The Wildcats picked up a Top 15 finish in the boys’ state meet with 96 points. The team was led by senior Christopher Thames’ silver medal finish in the 100 breaststroke (50.21). The time is an All-American Consideration time. Lakeside’s Vikings were 30th in the team competition led by sophomore Sam Witcher’s ninth place finish in the one-meter diving (424.20).